A white background and red print. This high quality low noise tape is ideal for busy packaging departments. Ideal for use with our Heavy Duty Hand Dispenser. For more information please contact our sales team on the details below. Alongside the Corner Protectors, Mini Rolls our Handy Wrap provides the ultimate protection for your products. This can be wrapped around the Cardboard Corners to ensure they are kept in place without the need for adhesive or staples. Please contact us for samples, pricing, or any other questions you might have. 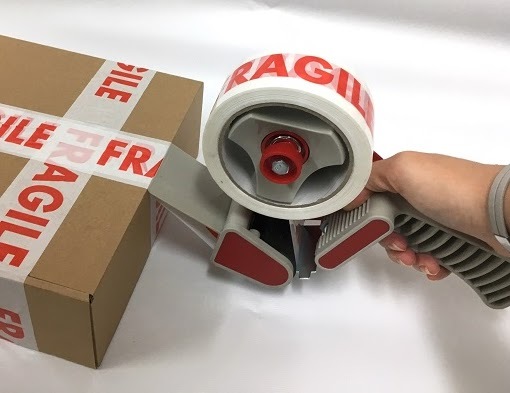 Adhesive Transfer Tape is a wonderful alternative to our double sided tapes, they are quicker and more accurate to use than had applying double sided tape. We manufacture several different adhesives grades for our ATG range, each offering a solution for a variety of different applications. Our 201 is a clear acrylic transfer tape with a plain white release liner, this is permanent and will bond paper to card. Indoor applications only. 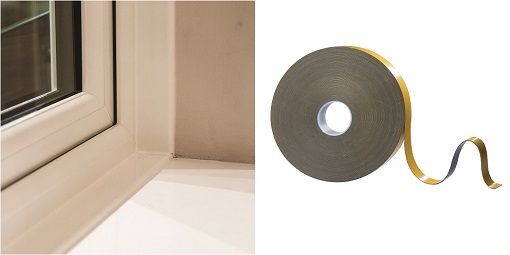 A permanent reinforced scrim adhesive transfer tape. 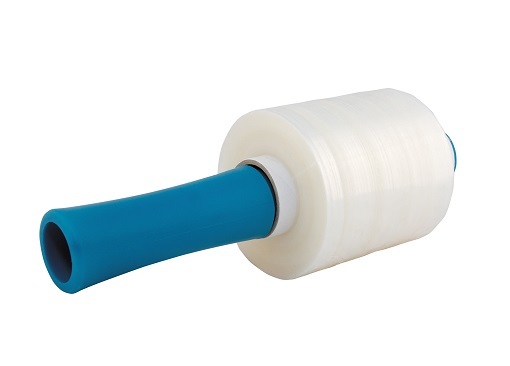 This tape is ideal for paper, card, and some plastic applications. Suitable for indoor use only. 203 is a high tack clear solvent acrylic transfer tape, which is ideal for mounting paper, card and some plastics. Suitable for indoor applications only. Ideal for paper, card, plastic, boards, fabric, and many other difficult to adhere surfaces in the print and display industry such as mat finished board. Suitable for indoor applications only. We also offer a selection of dispensers and adaptors to aid in ATG Tape applications. For more information please contact our dedicated team. PH7 -70 is a white 70gsm single sided paper with an acid free pH7 neutral acrylic adhesive. 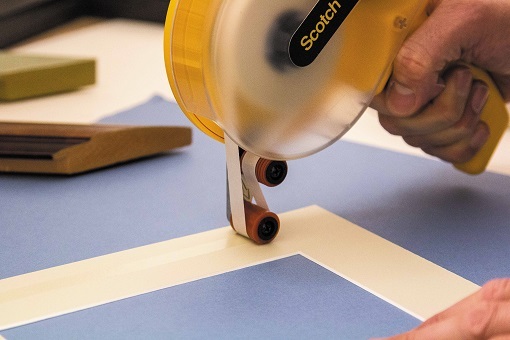 It has a high initial tack, which is great when working with heavier, textured or uneven paper and mount board surfaces. 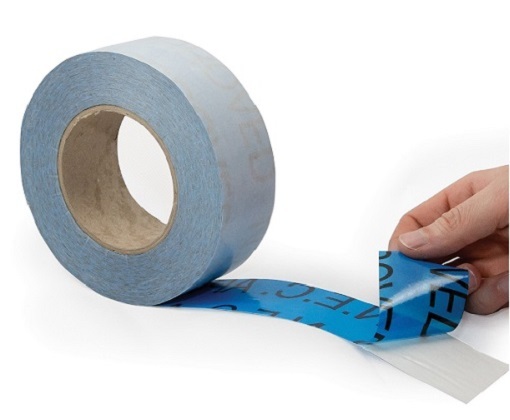 Due to the high initial tack the tape is permanent and can be difficult to remove. 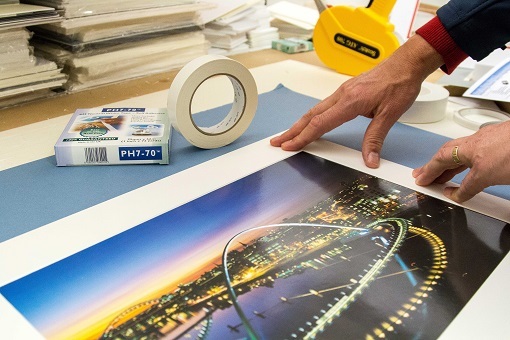 When hinging art, always hinge from the back of the art, only 25mm wide x 5mm deep of the tape should be on the artwork. 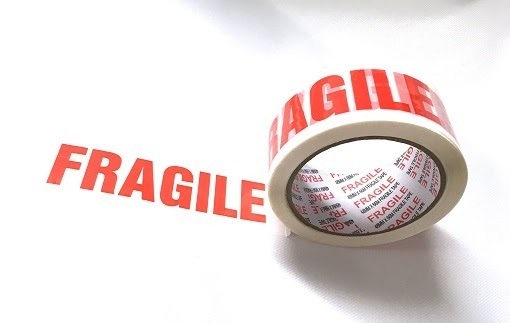 Always place the tape at least 40mm or more away from the image. Do not use on high value or irreplaceable art. This tape is also available in double sided ATG format for quick and easy use. Carpet Tape is specifically designed for temporary carpet installations direct to exhibition hall floors. It is easily peeled off from carpet backing and floor substrates when required without leaving any residue to clean. National Exhibition Center Approved. Available in 50m length rolls with a variety of widths. Contact us on the details below for further information or pricing. 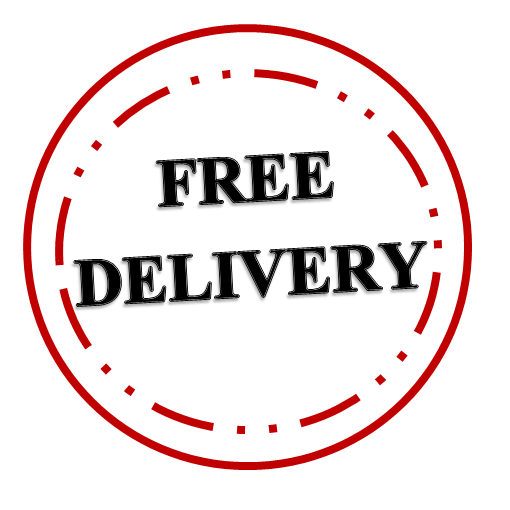 For orders outside the UK or trade orders please contact our sales team. UK Industrial Tapes offer our FoamLINK 1103H+ for the security trim application. This double sided superior closed cell PE foam has an ultra high performance modified acrylic adhesive system. The FoamLINK's PE foam construction provides excellent conformability and is therefore ideal for rough, uneven and structured surfaces. In addition the foam offers excellent sealing, dampening and vibration absorption capabilities, ensuring that bonded joints remain permanently secure, even in critical and exacting applications. • Developed to stick to UPVC, Polypropylene, Styrene and other hard to adhere plastics. • It has a fantastic initial tack. • Modified acrylic adhesive coated onto a PE foam. • Temperature resistance of -40°C to 90°C. • Easy to remove paper release liner. • High shear, high peel, highly cohesive mass. For further product information sample or pricing please contact our specialist team.